We all love showing off a gazillion pictures of our cats on our phones these days. Unfortunately, many of those photos are terrible. This comes to a head during the festive season, when you’re guaranteed to receive at least one holiday card starring a photo of a friend or relation’s cat who winds up looking like some sort of demonic-eyed monster from a horror movie. But hold on! You don’t have to be that person! 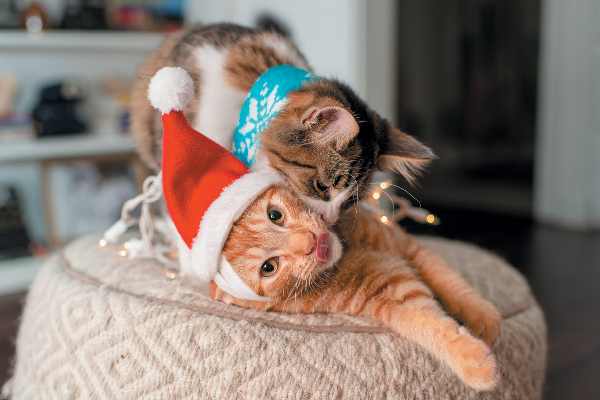 With some smart insider’s tips from three professional cat photographers — Casey Elise Christopher, Christina Gandolfo and Andrew Marttila — here’s how to pull off five slick photo scenarios with your festive feline. 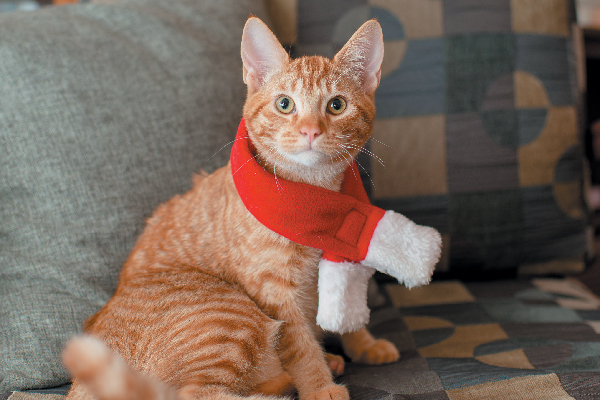 How can you get your cat to dress up for holiday photos? Photography ©Casey Elise Photography. 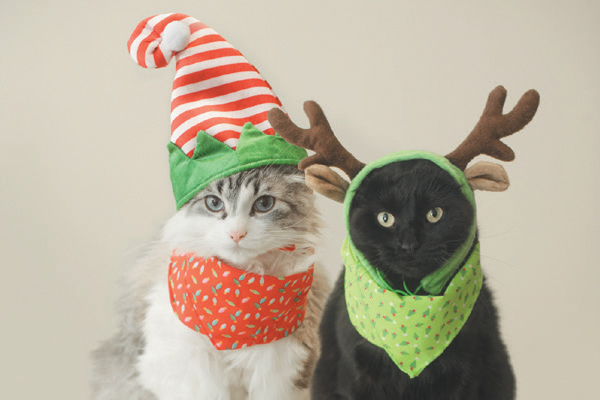 Some cats might not enjoy being dressed up — but that doesn’t stop us from trying to slip them into costumes for holiday cards. If you’re looking to capture a shot of your feline in an ugly sweater, Christina warns that patience is required. Just remember: Whatever costume you have in mind, prepare a clean and clutter-free area in your home to take the pictures before you dress your kitty up. “You don’t want to get the perfect shot of your cat in an antler hat and suddenly realize you have the bathroom with the toilet seat open in the background!” Christina says. And never dress up a cat who doesn’t like it! If you try to dress up your cat and you’re getting signals that she’s in distress or not liking it, stop immediately. There are tons of other tips to get cute holiday photos without costumes (see below). Ensure your holiday photos have a good backdrop. Photography ©Sun_apple | Getty Images. One way to avoid a cluttered background is to set up a quick backdrop. Christina recommends pinning up a colorful sheet or using foam core to create a clean setting. You could also use wrapping paper to fashion a funkier backdrop for your feline, whether you tape the paper to the wall or wrap a flat box with it. Finally, for a pro-looking feline portrait, you’ll need to get down to your cat’s eye level rather than shooting from above, which can be unflattering. “That way it’s easier to get the cat’s facial expression and also not have your own shadow cast on them,” Casey explains. 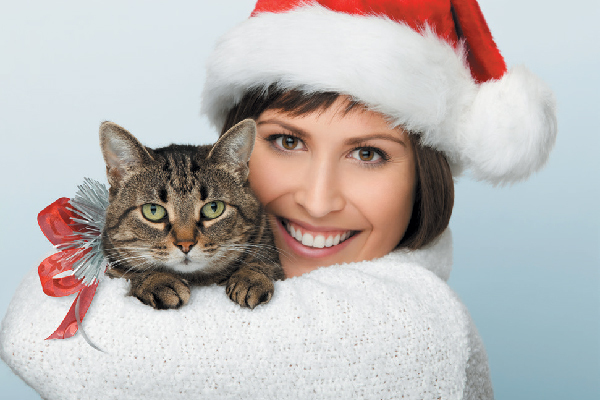 Cat and human holiday photo together. Photography ©CAP53 | Getty Images. Once you’ve selected a clutter-free location, pulling off a human and feline photo is all about working with your cat’s tolerance to being held. This way, he adds, “you can turn them to the camera” before capturing a family moment. Just don’t forget to smile yourself. 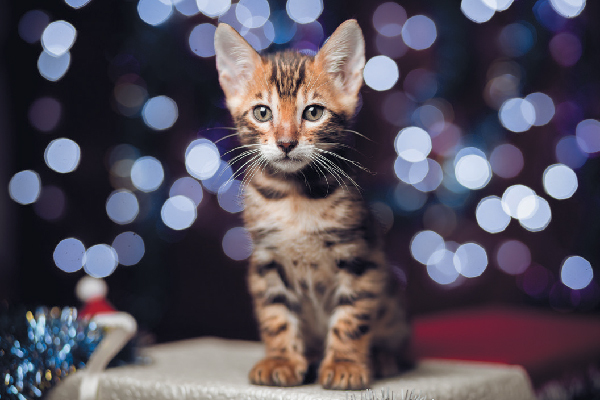 How can you pose your cat with festive props? Photography ©gabes1976 | Getty Images. 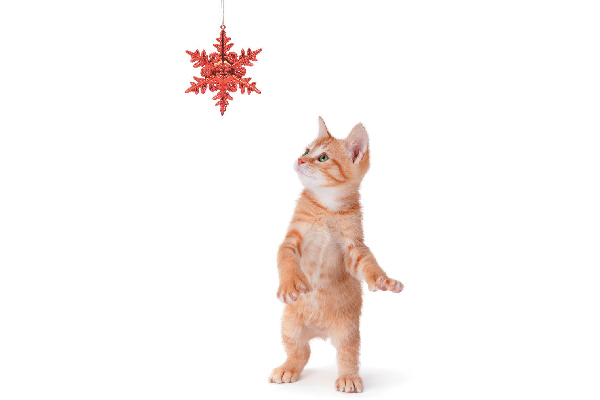 Posing your cat with a cat-safe ornament or trinket is a smart way to pull off a holiday card. “The cat will usually interact and check out a new thing on their own, especially if it’s the size of a toy,” Casey says. But be ready to snap quickly: As Christina points out, your kitty might become disinterested in your cherished tree ornament pretty quickly. What’s the best way to get good holiday photos of two (or more!) cats? Photography ©Casey Elise Photography. 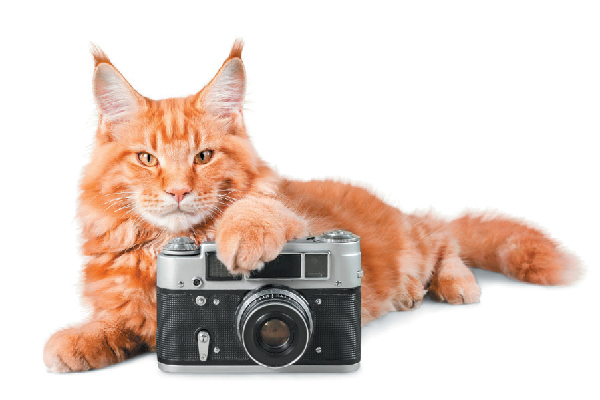 Meet our expert cat photographers! Photography ©artisteer | Getty Images. Casey Elise Christopher is an animal advocate and photographer living in Los Angeles. Her passion is photographing animals to help them find a home, and she strongly believes that photography is a critical part of the adoption process. Here she is with her former foster kitten Rigby. See more at caseyelise.com. Christina Gandolfo is a Los Angeles-based advertising and editorial photographer whose cat photos have appeared in such publications as Harvard Business Review, The New York Times Magazine, The Huffington Post, Los Angeles Magazine and Catster in addition to advertisements for national brands like Friskies and Mars Petcare. You can follow her work + personal photos of her three cats — Lucy, Doo & Blondie — on Instagram @gandolphoto. Andrew Marttila’s photography depicts the lives of celebrity cats, shelter cats and house cats with intimate detail. Andrew reaches thousands of cat lovers through his social media (Instagram: @iamthegreatwent), where he documents his travels promoting shelters across the country, taking photos for clients and snuggling with his cat, Haroun. His book, Shop Cats of New York, offers a close-up look at the lives of cats living in NYC’s storefronts. See more at thegreatwentphoto.com. Thumbnail: Photography ©RealCreation | Getty Images. Thanks! We agree that cats who don’t like being dressed up should not be dressed up, so we added a bit about that in our article. However, some cats actually like being dressed up! There are also some cats with sensory conditions that are comforted by the feeling of clothing, as well as cats without sensory conditions who have fears and anxiety eased during stressful (and often unavoidable) situations, such as during fireworks season, when a new baby is in the house, when guests come over, etc. I’ve also met some cats that will actually go and pick out a sweater or vest to wear and bring it to their person for help putting it on! Obviously no one should torture their pet if they’re uncomfortable, but to say that “dressing any animal at any time is a disgusting practice” is ignoring that there are some animals who do benefit from wearing clothing or other accessories, for reasons much bigger than human entertainment.